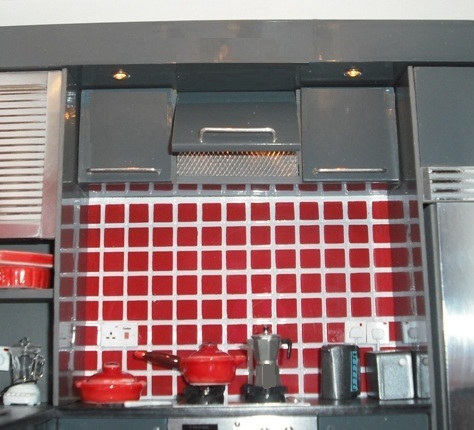 For our latest kitchen we started with metal tread flooring for the kitchen, and black and white tiling for the utility room (lighter colours suit smaller rooms better). 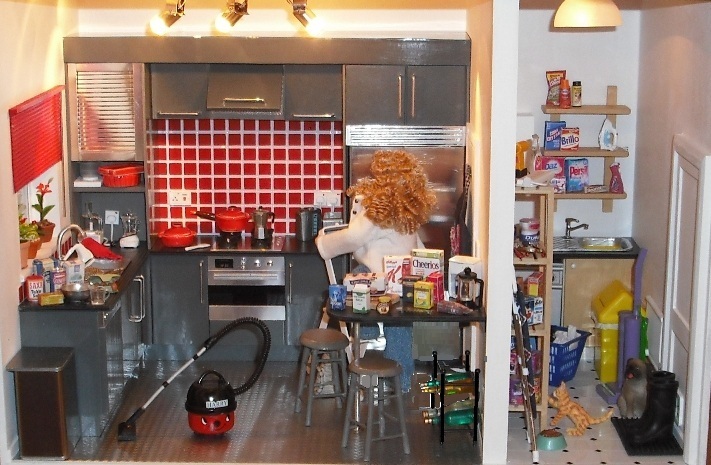 The units in both kitchen and utility room are EAZY kits. In the utility room we've used a single base unit with an extended top to include a Delph washing machine, and above these we've used a simple ELF shelf unit to display a variety of miniatures - washing powder, cleaning products and an iron. The main units in the kitchen have been finished in hi-gloss anthracite. We have added several new items to the EAZY range - a roller shutter unit that will sit on the worktop, a built-in dishwasher (this unit comes with a stainless steel control panel, and a door that you can complete to match your units, and a new built-in American fridge freezer unit. 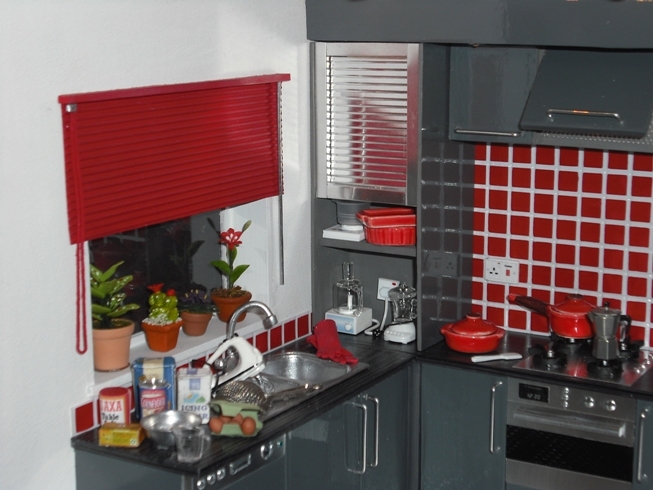 We created a contrast with the grey of the units by adding a red tiled splashback and a red blind. We've continued the red theme with the beautiful quilted oven gloves (tucked into the pocket of a cook's apron) and a set of Le Creuset type cookware. We've used the shutter unit to house some essential kitchen appliances - the food processor and a blender, both available from Delph Miniatures. We've brightened the window sill with a variety of houseplants. There wasn't enough room in this kitchen for an island, so we've created a breakfast bar cut from an ELF worktop in Ebony effect, on which you can see a variety of store cupboard items. In the utility room is a useful shelving unit. We've used the space to store a variety of pet foods and handy tools. Small details add realism to your creations. We've used a central heating radiator (along with a boiler), and note the cooker socket, and the light switch. We've put a door mat by the back door with a pair of wellies - and a cute dog waiting for his walk! Finally of course, lighting is important. In the utility room we've used a simple dome light, while in the kitchen we've used three swivel spots for the main lighting, but also created a couple of downlighters using grain of wheat bulbs and easily-obtainable eyelets.